media update’s Adam Wakefield was at the Nelson Mandela Centre of Memory in Johannesburg on Wednesday, 26 July, where South Africa's Top 50 brands of 2017 was revealed, being a joint effort between Brand South Africa, Brand Finance, and Brand Africa. Around 90 people filled the auditorium at the centre, where Brand South Africa strategic relations manager, Toni Gumede, welcomed visitors, with several speakers taking to the lectern over the course of the event. 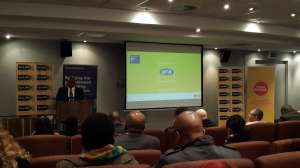 These included Brand Africa and Brand Finance chairman Thebe Ikalafeng, Brand Finance director Jeremy Sampson, and Brand South Africa CEO, Dr Kingsley Makhubela. When Ikalafeng’s chance to speak arrived, he noted how in the work Brand Africa has done, only 17 of the top 100 brands on the continent are African. “It is to understand the opportunity that faces us as Africans and South Africans,” he said, pointing out how Basotho blankets are being sold in Paris at extremely high prices. The question Ikalafeng asked was: Why did we not do that first? Sampson took the stage after Ikalafeng to get to grips of what constitutes the Top 50 brands, and in particular, the Top 10. “Currently, in the last year, the top 10 [brands] of South Africa have grown in value by three percent. What did the economy grow by? Plus minus one percent, maybe less. Brands are out performing the economy. That is why brands are so important,” he said. Capitec and Foschini had both experienced 25% rises in their brand value of the last year, while SAA (24%), Mediclinic (22%), and Bidvest, which was split, saw falls in their brand value. Even though MTN was again number one, the telecoms giant has seen over R13-billion shaven off its brand value, compared to 2015, and Sampson said MTN had had a “pretty torrid time”. It was a pertinent reminder that brands can go up and they can go down. Makhubela, closed out the event, pointing out how Donald Trump had damaged the United States’ brand reputation tremendously, and urged South Africans to behave differently. In Poland, mass demonstrations have seen the president changing tack on proposed judicial reforms, with the protests being peaceful. In South Africa, the situation is often different. “I saw sometime in the newspaper that we have had more demonstrations than anywhere else in the world. The violent nature they are, they keep affecting the reputation of the nation brand,” he said. The Top 50 brands report is available here. For more information, visit www.brandsouthafrica.com.